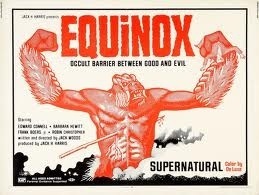 “Equinox” is one of the most fascinating student films ever made. By that I mean, it began as a student film and was eventually fleshed out into a full length Sci Fi/Fantasy/Horror film. It’s amateurish at times (especially the acting), and I could understand not being able to overlook its flaws to enjoy the genuine imagination at play here. It wasn’t originally on my list, but it’s been awhile since I’d seen it, now seemed like a good time. 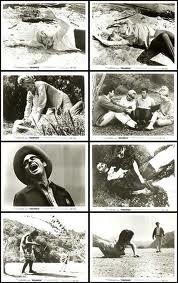 The film is about a group of students who are trying to meet up with their professor in the woods. He is nowhere to be found, and his cabin has been partially destroyed. A mysterious forest ranger named Asmodeus keeps an eye on them throughout, but what secrets is he hiding ? 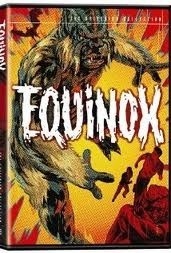 The group finds a mysterious old book, are attacked by giant creatures and attempt to solve the mystery of the Equinox !! As I said, the cast is made up of unknowns, with the exception of Frank Bonner who would go on to co-star in “WKRP in Cincinnati”. This is his film debut, and I guess he does as good a job as anyone starting out by being in a movie that took 3 years to complete. The actors clearly age throughout, and one of them has fluctuating sideburns at certain times. Of course, this all lends itself to the fun of proceedings and would probably make a good drinking game. 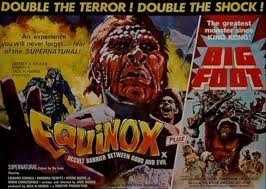 “Equinox” is exactly what you think it is from watching the trailer. 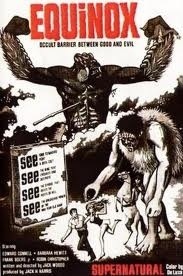 It has a bit of an Ed Wood meets Ray Harryhausen vibe that is a real blast. 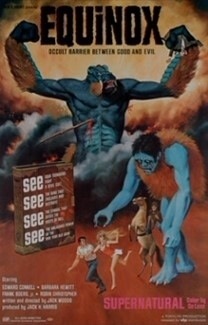 It was clearly an inspiration on “The Evil Dead” as well, another excellent low budget horror (though a lot better made than this one, I’ll admit). Considering this was made in the late 60’s on a shoestring budget, they actually do a pretty commendable job. One of the coolest things about this movie is the amount of respect it receives despite its obvious shortcomings. It’s regularly screened on Turner Classic Movies, has a Criterion DVD release and has been cited as an influence on many other genre films. It’s always nice to see a low budget film with a lot of heart being embraced by a wider audience than was ever dreamed of when making the film itself. Clearly this kind of movie isn’t for everyone, but get a couple of friends together, a case of beer, some snacks and a couple of jazz sticks and you’ve got a fun night on your hands. Plus, it’s only like 80 minutes long, what have you got to lose ? Brain cells I guess, but anyway, enjoy ! This entry was posted in Reviews and tagged blood, criterion, cult, devil, Equinox, fantasy, gem, harryhausen, Horror, Horrorthon, indie, low budget, October, review, Sci Fi, sinbad, student by lazron. Bookmark the permalink.